Trikes and (odd) bikes. : 18th September 2017 Kerb Lemmings 'R' Us. Monday 18th 42F, 6C, calm with thick mist. Houses 50 yards away are just visible though not clear. The eastern sky looks brighter so there is still hope of some sunshine if the mist clears. Which it did as I walked to the village and back. A large tractor was busy, somewhere out in the mist, but I couldn't see anything. So I had to content myself with some atmospheric shots of a patiently waiting, fuel tender. The London idiot who rode a bike without a front brake has been sentenced to 18 months in a young offenders institution. The lady pedestrian, whom he hit with his thick head, received a death sentence, without appeal, or any chance of parole. Her innocent family left uncomprehending and grief stricken by her summary execution. How many more copycat fuckwits will still claim they didn't know it is illegal to ride on the public roads without a front brake? Why not set a huge automatic fine and automatic crushing of their machines to <cough> fix their attention? Mark Beaumont from Scotland has just smashed the Round the World cycling record in under 80 days. 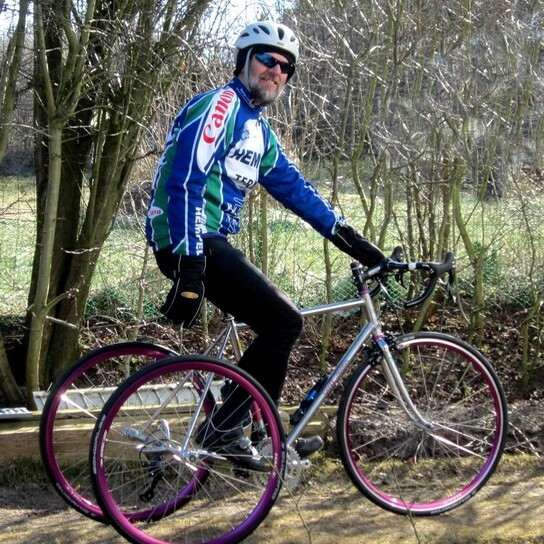 He needed to average 240 miles per day and set a new record for most miles cycled in a month as well! One superhero popularizes cycling. Another trashes cycling and breeds cyclist haters. One is a real cyclist. The other a deluded, immature prat. Or not. See below. http://www.bbc.co.uk Mark Beaumont smashes round the world record. Tuesday 19th 50F, 10C, bright but cloudy with a whiff of a breeze. Rain this afternoon. A recent bit of research suggests that electric bikes are good for rider fitness. Provided they still have to pedal to go along it wad found that most riders worked as hard as a battery-free cyclist but went a lot faster. The side effects of "getting out there" compared with sitting in a car or train for a daily commute would seem to be equally beneficial IMO. The extended range on offer to Tesla girls and boys should make many marginal distance commutes far more psychologically manageable. A knowledgeable person pointed out to me, the other day, that the two young persons on Focus MTBs were actually, electrically assisted. I had no idea electric bikes could be so sleek! Though the weight more closely matches a "human assisted" trike at a not-inconsiderable premium in price! £5K for the top end models @ 22kg suggests some serious progress is still required in battery weight. I could power my own trike with hot air but hydrogen might be more <cough> universally available. My walk sent me along the track to the woods. Where there was considerable effort going on to plough and resew the prairie. With a pair of large tractors working together on the ploughing. Meanwhile an immodestly sized, seed drill was trundling back and forth further on. Doubled wheels, all around, presumably to reduce ground pressure, seems to be popular around here. I wouldn't want to meet one of these in a narrow lane on my trike!